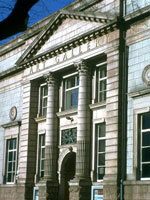 Located in a former Grecian-style mansion near George Square and Buchanan Street, the Gallery of Modern Art (GoMA) displays Glasgow's extraordinary range of post-war art and design. Opened in 1996, the gallery includes works by Niki de Saint Phalle, David Hockney, Sebastiao Salgado, Andy Warhol and Eduard Bersudsky as well as Scottish artists such as John Bellany and Ken Curry. GoMA is Scotland's most visited modern art gallery, and is conveniently located in Royal Exchange Square, in the heart of the city. The permanent collection tends to divide visitors, with hugely varied reviews of the museum from tourists, with some visitors finding it fascinating, inspiring and edgy, while others lament the lack of 'real art'. The statue of the Duke of Wellington with a traffic cone on its head, just outside the museum, has become rather iconic. There is free internet access in the museum and an impressive library, with an extensive collection of art and design books and a simple cafe. The gallery hosts special events and exhibitions throughout the year; check the official website to see what is on during your visit.